If your New Jersey Boating Safety Certificate is lost or damaged, the New Jersey State Police Marine Services Bureau can help replace it. 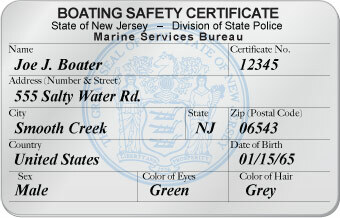 Please visit the NJSP Marine Services Bureau website for more information on replacement certificates. The boating safety certificate is proof that you have successfully completed an approved New Jersey boating safety course. The boating safety certificate does not expire and does not need to be renewed.